There’s always that one kid. You know the one I’m talking about. The one that distracts the rest of the class and just does not want to focus. You expect this. You prepare for this every week. But for some reason, today this child just does not seem to respond. You don’t want to yell at him/her; but you do want the kids to learn about God. What’s a teacher to do? This happened to me last Sunday while teaching my second and third graders about the crazy prophet Ezekiel, the prophet who had to cook his bread over poop (they loved that). I had one child that decided he was going to stand up on his chair during the lesson. I’m not sure what possessed me but rather than fight it, I decided to go with it. 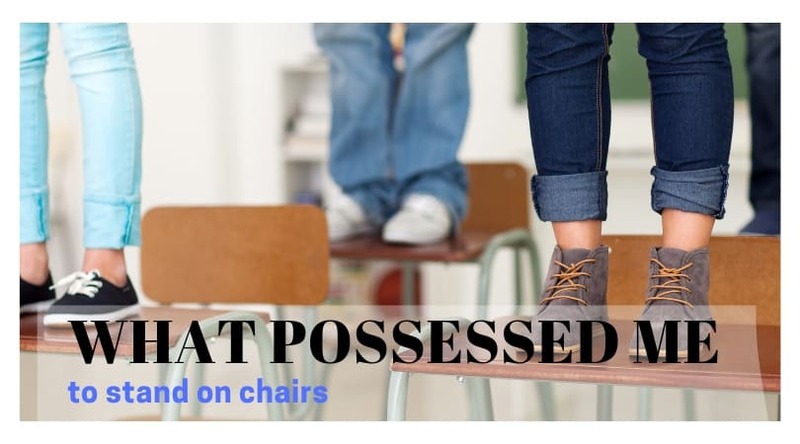 I said, “Alright class, who wants to stand on their chair?” Of course they all shouted out, “Me! Me! Me!” I told them they could all stand on their chairs, but they had to stay on the seat, no one could put their feet on the backs or this game was over for everyone. (The chairs are short but I still did not want them tipping over.) Now how to tie this into the lesson and make sure they were paying attention…. I instructed them to listen carefully. I was going to read a few sentences then ask them a question. If they answered correctly, they could stay standing and if wrong, they would sit until they next question. It worked amazingly well. They focused because they were doing something in bible class they thought they would never be allowed to do. They listened and they learned! What’s more, we were able to tie it back to Ezekiel. God had Ezekiel do some strange things to get people’s attention and here we were standing on chairs to help us pay attention. Being a teacher can be hard sometimes when kids don’t fit into a little box of listening quietly, raising their hands to answer questions, and staying seated to do an activity. As teachers, we need to think outside the box. Don’t always fight what’s going on, but roll with it. You will have kids that love being in your class and they will learn more than ever.